One of the most beautiful places in Tbilisi, which reflects Georgia's past, is the Narikala fortress. No one leaves this place without wonderful emotions and it is one of the sites most frequently visited by tourists and guests. 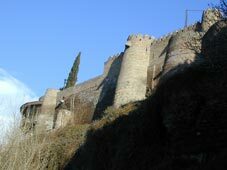 Narikala is an ancient fortress which overlooks Tbilisi and the Mtkvari River. It consists of two walled sections on a steep hill between the sulphur baths and the botanical gardens. Its lower courtyard contains the recently restored St Nicholas Church. The fortress was established in the 4th century as Shuris-tsikhe (i.e., "Invidious Fort"). It was considerably expanded by the Umayyads in the 7th century and later by King David the Builder (1089-1125). The Mongols renamed it "Narin Qala" (i.e., "Little Fortress"). Most of the extant fortifications date from the 16th and 17th centuries. In 1827, parts of the fortress were damaged by an earthquake and were subsequently demolished. The ruins of the ancient boundary wall of the mother castle of Narikala still stand on the western ridge of Sololaki (in the Old Tbilisi district). The name Narikala first appeared in the 18th century, until then it was called simply Kala. In the 6th century King Dachi, son of legendary Georgian king Vakhtang Gorgasali, strengthened and widened the old castle on the site and the Kala castle thus became the most important defensive castle and royal residence in newly-founded Tbilisi. The citadel has several times been stormed by foreign invaders and many times restored by Georgians when they regained it. In the 13th century St. Nicholas Church was constructed within Kala castle. When Georgia was occupied by the Russian empire a Russian garrison was deployed at the castle. No more services were conducted in the church and it became a gunpowder magazine. A subsequent fire resulted in the gunpowder exploding, destroying the church and other buildings. According to one version the fire was started by a thunderbolt and the people perceived this as a sign from on high. The new St. Nicholas Church was built on the same site as the previous one in 1996-1997, as an exact copy of the previous church. It is of “prescribed cross” plan and has doors on three sides. the church is faced with well-hewn yellowish-sand coloured squares, which form crosses under the pediment, the window and the two rectangles arranged vertically in the centre of the eastern facade. The facades are simple, the windows placed in simple frames, and the walls are flat throughout, though the bunch of slim columns “cut in the middle” leading to the lower part of the building give the building a kind of unfinished aspect. Fragments of the previous building are incorporated in the western and northern parts of the church.